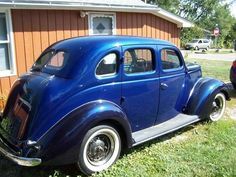 1937 Ford Model 78 restoration-friendly reproduction body panels, bumpers and interior pieces to chrome exterior trim items, mechanical parts, emblems and weather stripping, practically every part you will ever need to build a 1937 Ford Model 78 Fordor is now available. If you notice the \'37, compared to the \'36, it has a little more of a hungry look to it. The 85hp 221CID L-head V-8 came in for its most significant revisions to date. Determined to cure the flathead\'s overheating problems once and for all, Dearborn\'s engineers relocated the water pumps from the heads from the block, and increased their capacity. Brakes were overhauled from the archaic system of mechanical rods giving way to a cable-operated system-hydraulics which were still out of the question, as far as Henry was concerned, even if buyers had come to expect them. Not a dollar that was spared on a complete total restoration of this classic and has been relentlessly taken care of in a climate-controlled warehouse. It has gone through an extensive service recently replacing the spark plugs, changing fluids, cleaning the carburetor inside and out, new brakes and fuel lines. Under the hood you’ll find the magnificent 85HP 221 CID “L-Head” V8 engine mated to a 3-speed sliding gear manual transmission that shifts smoothly and with ease as well as the Stromberg 97 two-barrel downdraft carburetor. Going on the outside the first thing you’ll notice which is truly unique and rare in ‘30’s era are the suicide doors which closes as if it just came off the assembly line. All the panels and trimming line up precisely and perfectly with the contour of the body and frame. Please Note The Following **Vehicle Location is at our clients home and Not In Cadillac, Michigan. **We do have a showroom with about 25 cars that is by appointment only **Please Call First and talk to one of our reps at 231-468-2809 EXT 1 ** FREE Consignment Visit Our Site Today Easy To List Your Vehicle and Get it Sold in Record Time.